ORLAND, Calif. -- A California Highway Patrol officer was looking at his computer while driving when he crashed into a stopped vehicle in Northern California Tuesday, killing a 15-year-old boy. 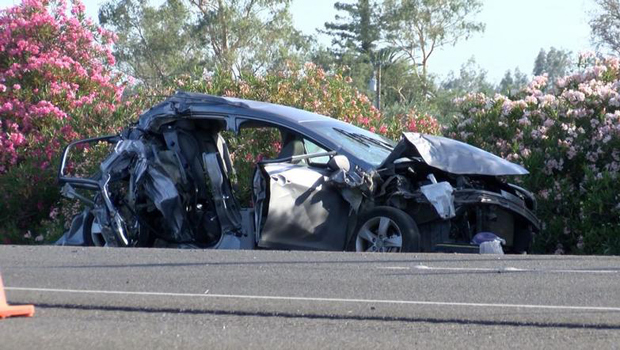 According to CBS Chico affiliate KHSL-TV, the teen was a passenger in a Hyundai Elantra that was stopped in a construction zone on Interstate 5 near Orland, about 100 miles north of Sacramento. Authorities said a CHP officer driving a mobile road enforcement truck down I-5 was looking at his computer but didn't notice the stopped traffic ahead in time to avoid a crash. "When he looked up, traffic was slowing and coming to a stop, applied his brakes and rear-ended the vehicle that was in front of him, which subsequently got pushed into two other vehicles that were stopped," CHP Sgt. Tony Odell told the station. Weston Sites, a 15-year-old from the town of Willows, was killed in the crash. According to the Chico-Enterprise Record newspaper, two other teenagers were taken to Enloe Medical Center in Chico. CHP officers said a separate accident investigation team will be handling the collision investigation.